Cakes & More: Chocolate Coffee Cookies - SRC Time Again! Softish chocolate cookies with a mild coffee kick. Actually sort of brownies masquerading as cookies. Low fat and easy. Well, if you look at it, when it comes to baking a lot of things like chocolate cookies or even brownies, though simliar ingredient wise, they invariably find their way into the baking list again and again, thanks to the lure of different textures and techniques or varying flavors. 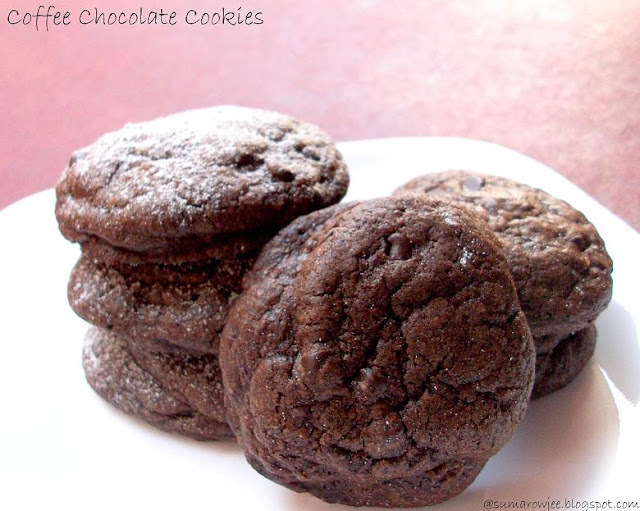 Gooey centers, whole grain, soft, flaky, low fat, super easy, just cocoa, loads of dark chocolate and barely there flour, eggless - too much temptation and just another reason to bake - again!! This time around, I had another reason to add, the Secret Recipe Club! A yummy new blog, lots more yummy recipes, tick-tac-toe, tick-tac-toe which one which one do I choose? Jocelyn at Bru Crew Life sounds just like me when she says that her sweet tooth always manages to get the better of her! Well, Jocelyn, I have my weight-woes (wail!!! ), can somehow keep up with a bit of exercise, but starving the sweet-tooth, IMHO is cruel ;-) and nearly impossible! Its a constant battle between my sweet-tooth, weight issues and the compulsive desire to bake all the time, sigh! Low fat cookies with my two of my favorite ingredients - chocolate and coffee, seemed to be just the thing to bake when I wanted to humor my sweet-tooth, with the problem of shrinking clothes on my mind. What better than baking to drive away the blues? :)). To minimize the danger of over-eating and to feel slightly virtuous about using only 2 tablespoons of butter, I made half the recipe on Jocelyn's blog. The recipe calls for espresso and since I have not come across a good brand of instant espresso powder, I have used instant coffee. Good, soft brown sugar (not demerara sugar, which for me is good as a crunchy topping, but surely not for use in cake batter or cookie dough as it just doesn't dissolve!) is expensive. I had once got some brown sugar from Hypercity, a brand called Waitrose if I remember right, but it was quite expensive, I do remember that! Soft, moist, quick-dissolving fine grained sugar, which can be packed into the measuring cup. How I wish molasses was available for sale here. Otherwise, making brown sugar at home is as simple as stirring together molasses and fine grained sugar! The amount of molasses could be varied to make it either light or dark brown sugar. I have used a brand called Trust which is not as soft or moist or as fine grained but works. Procedure: Mise en place. Sift the flour, baking powder, instant coffee powder and salt. Next time I bake these, I will stir in the coffee into the warm chocolate for a more intense coffee flavor. Keep aside. Place chopped chocolate and butter in microwave-safe bowl. Microwave until almost melted in spurts of 30 seconds on HIGH power. Make sure you melt the chocolate smooth and liquid or the cookie texture may differ. Set aside to cool slightly. Beat brown sugar and chocolate on high speed of an electric mixer until light and fluffy, about 2 minutes. The sugar will not dissolve completely and remain a bit gritty. Add the egg, beat for about 30 seconds on low speed till it is well combined. With the mixer on low speed, gradually add flour mixture to chocolate mixture. Beat until smooth, this will take about 30 seconds. Stir in chocolate chips. The dough will be soft and sticky, but will firm up as it stands. Wrap dough in plastic wrap. Refrigerate about 4 hours. The dough will now be very firm. Preheat oven to 180 degrees C /350 F. Line baking sheets with parchment paper or silicone liners. Pinch out (about 20 balls) and roll dough into 1-inch balls. Place two inches apart on baking sheets, they will not spread a lot. Bake 12-13 minutes (recipe says 9-10 minutes) or until browned around the edges (but this is tough to make out!). Do not over-bake or the cookies will be dry. Cool cookies on wire racks. The cookies will puff up and feel soft in the center when pressed lightly when they come out of the oven. But they will harden as they cool. So please do bake a test batch, allow the cookie to cool completely before you taste and decide the baking time for the rest of the cookies. Please note: As with most cookies, these taste best warm. I liked them most, texture and taste-wise when I baked the cookies after 4 hours of refrigeration. The batter left in the fridge over-night gave me cookies which were great out of the oven, but slightly dry later. The cookies do not taste too sweet warm, but they did taste a bit sweet later. May be more coffee or less sugar next time? I would not store these for more than a day though. But you could try microwaving any let over cookies. If you are looking for buttery tasting cookies, these may not be the cookies for you. 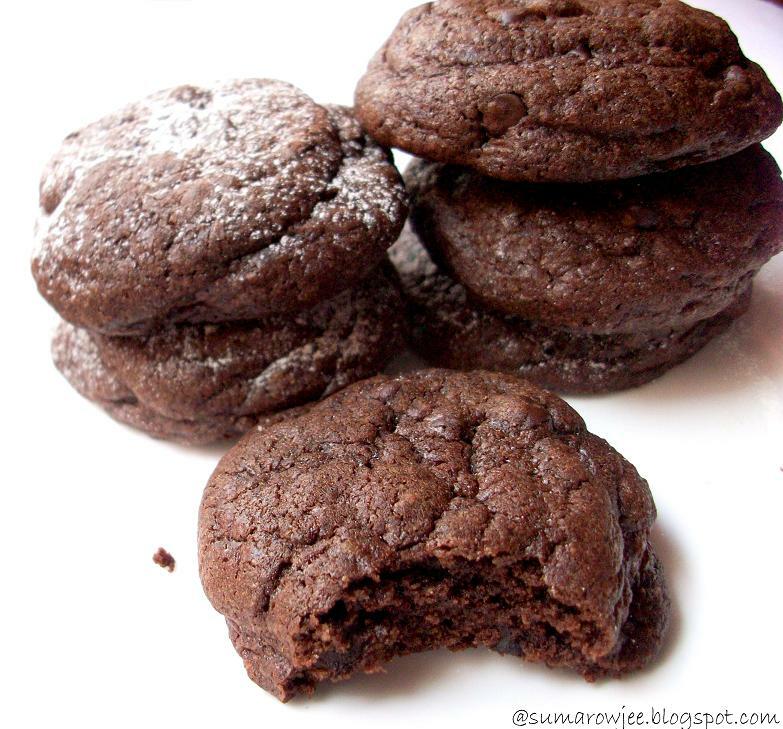 Very chocolate, warm cookies with less fat - yes!! If you love chocolate and coffee both, you must give these a try! 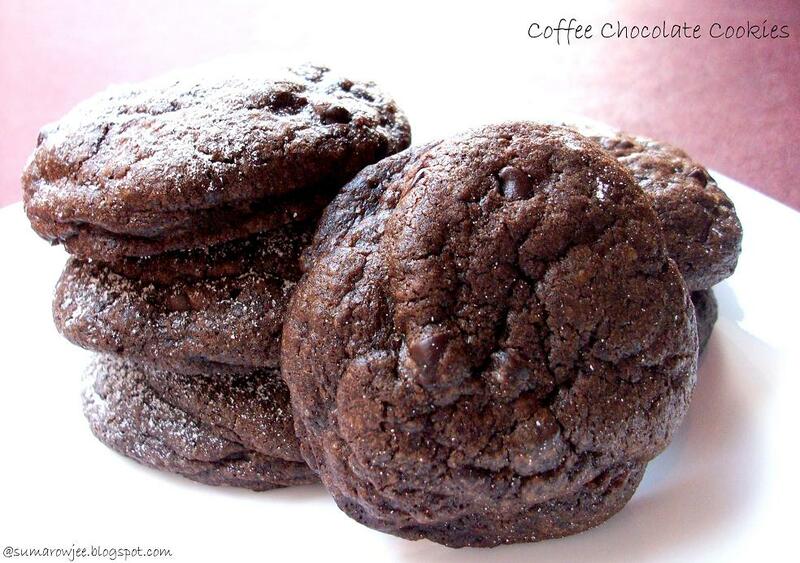 My husband will love these cookies with coffee. These look absolutely delicious Suma..I think I will bake a batch for my mum, she loves coffee and chocolate...love the colour of these cookies ! TH has brought some coffee powder from Java, time to open it up ! These cookies look absolutely amazing! I want to grab one because it includes both coffee and chocolate.. my absolute favs! mmm.... they look yummy, delicious and chocolaty... Amazingly done. Three of my favorite things - coffee, chocolate and cookies - all combined into one. That's a winner and these look SO good! great feedback on the cookie texture, taste. very helpful! always have been a big fan of coffee plus chocolate when used in desserts together... i have only seen demerera sugar here what if i powder it first and then use.. that should dossolve better na? @Deeps - I haven't tried that..but u do get the regular brown sugar at GA, do check that out.. These sound fabulous! I find that espresso or coffee just gives chocolate desserts a little something special. Will have to try these soon! These ar e fab. My daughter is not going to sleep as she wants to eat them now. :) Bookmarking these. Will make it on weekend. Thanks. This is a must-try! They look SO delicious. What a wonderful recipe. 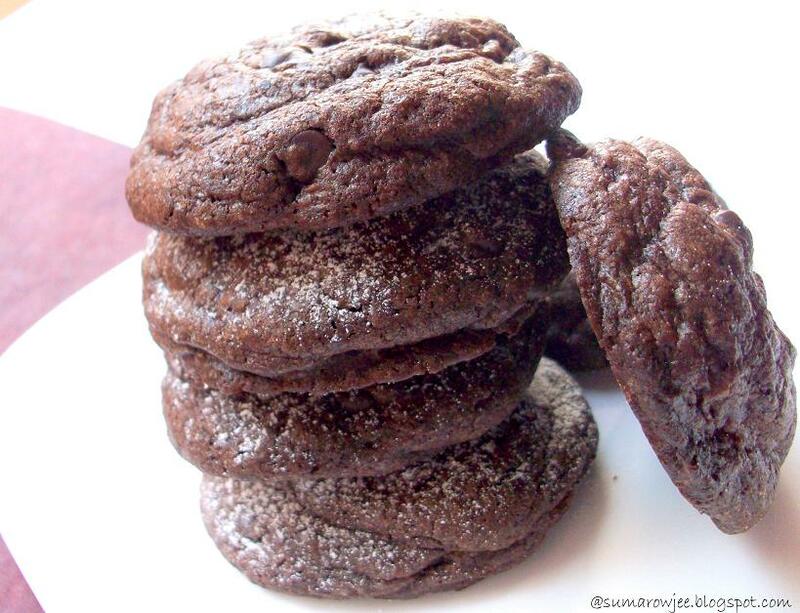 This chocolate cookies looks more chocolate-y than other recipes I find online! I really want to have a plate right now. Thanks for sharing the recipe.